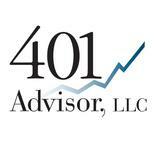 The stock market has been characterized by trading between two separate trading ranges in 2011. Using SPY in Chart 1 below the market bounced between a 9.25% gain and a 0% gain from the beginning of the year until August. 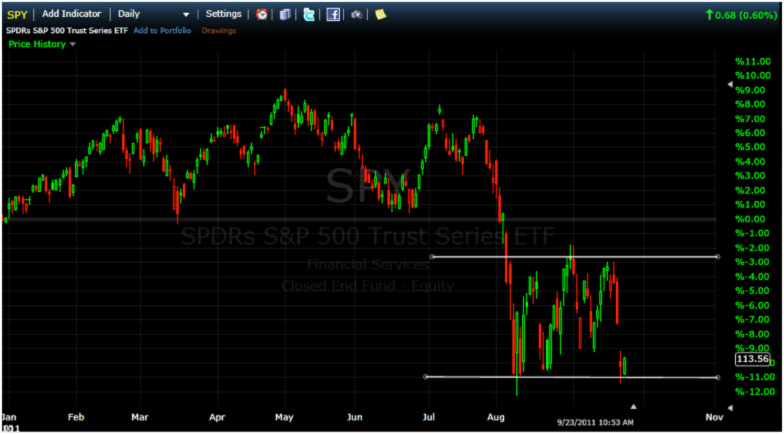 After the market bottomed in early August, it has again bounced within approximately a 9% trading range. Trading ranges eventually end. The question is will we break further downward again, or finally break to the upside? There are three issues the market has to work through to break out in a clear direction. The 500lb gorilla is Europe. Numbers 2 & 3 above just don’t matter until #1 is resolved. Most analysts are predicting a global financial crisis similar in scope to 2008 if we see sovereign defaults and or a breakdown of the EC. If Europe finds some way out of their dilemma, we are still facing softening earnings growth and softening economic indicators in the U.S. However, my guess is that we will see a very substantial relief rally if any solution is offered and agreed upon in Europe. Since I have no way of handicapping what will happen in Europe, let’s see if the markets are giving us any insight. 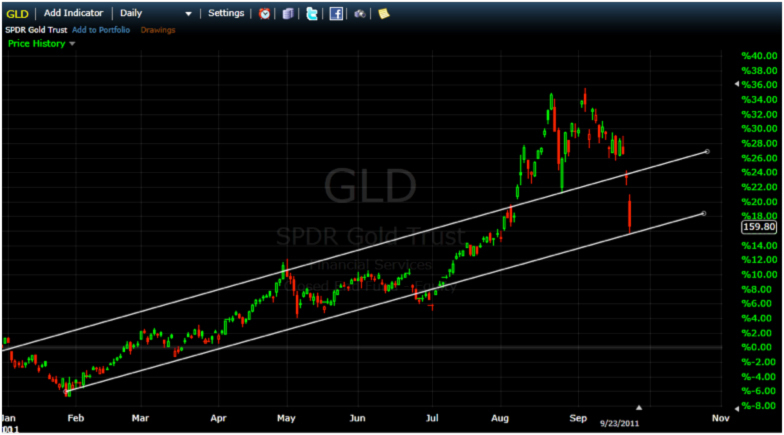 First, let’s look at GLD, the SPDR’s Gold Trust. The past week has pretty much wiped out the entire rally that started back in July. While an argument can be made that the recent selloff has just brought GLD back to its trend line, I think the severity of the drop, in such a short time is an indication of something else going on. If we look at the EC sovereign debt problem, one estimate I have seen is that for a complete bailout, including Greece, Italy, Spain, and possibly France would require 2.5 trillion Euros. With this kind of money printing you would think the reaction would be a further rally GLD. If we don’t see a huge bounce off the support line, up to if not through support than I would say GLD traders are betting heavily that there will not be a solution to the EC problems, which many have predicted will lead to global recession. The only explanation for gold’s action that does not contain the word “conspiracy” is that traders expect some combination of recession/depression/deflation in absence of a massive ECU bailout. Price action in GLD could be misleading, as GLD traded nearly 53 million shares, double its normal volume, on Friday the 23rd. That means that 5.3 million ounces of gold traded hands in the GLD ETF alone. Between high frequency traders, and conspiracy theories of market manipulation, such huge swings in GLD may not be as telling as they used to be. Let’s look at JNK for confirmation. 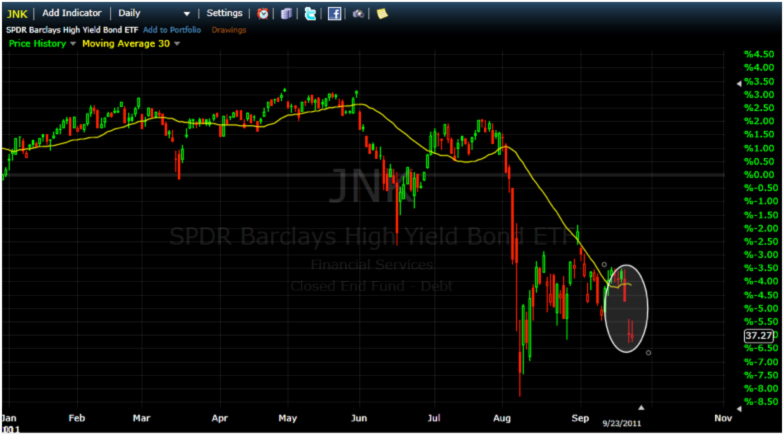 Below is the year to date graph for JNK, the SPDR’s High Yield Index ETF. I’ve included the 30 day moving average (the yellow line) with the price. High yield bond funds in general tend to trade very well with the 30 day moving average. Simply buy when the price is above the 30 SMA and sell when below. What’s interesting is that on 9/14 JNK broke above the 30 SMA indicating a buy. While “whipsaws,” or false signals, aren’t uncommon with any trend indicators, it is interesting that JNK did break into a “buy” signal before a very substantial sell-off the last three days. Looking at JNK since the early August collapse it has been trending back up before last week. Although trading has been volatile this shows a lack of concern for lower credit corporate. This is not the action one would expect if expecting the recession/deflation scenario. I went back and looked for yields on a high yield bond fund during the Savings and Loan crisis in the early 1990’s. I found data for Federated High Yield Bond (FHIIX),which hit a 17% yield in January of 1991 and over 12% in January of 2008. Its current yield of 7.34% hardly indicates traders are in crisis mode. So while some investors may question gold as a true market signal, its collapse last week was coincident with a similarly large drop in JNK. Rising yields on lower credit quality debt would indicate heightened fears of a recession as well. The sector most affected by a default in Europe would be the financial sector that has significant exposure to European debt. For the most part XLF, the SPDR’s Select Financials ETF, has mirrored SPY for the year. 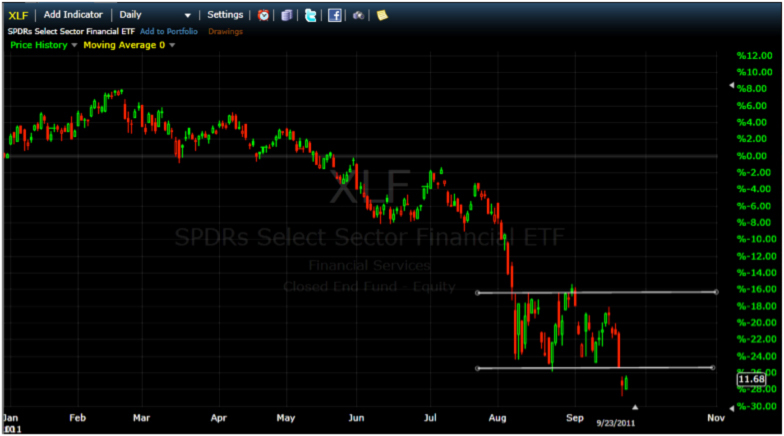 The big exception has come on September 22 and 23 when XLF clearly broke down under support. With Bank of America (BAC) trading under $6.50 there is obviously concern among the banking stocks. The week of Sept 19th has been pretty brutal for anyone betting on a U.S./global recovery presumably led by a European bailout. Traditional market indicators have shown a renewed sense of concern over whether or not there will be a bailout, or one big enough to make a difference. With the U.S. economic team lobbying for “something big” you would really think that GLD would be in a massive rally mode, or at worst, consolidating recent gains in a fairly tight trading range. GLD could be a huge trade if we see a bottoming process and the big bailout – measured in trillions not billions, that many seem to be lobbying for. While high yield bonds took a hit as well, yields aren’t compelling enough to tempt me to enter the market. Look at least for a cross over back above the 30 day SMA before buying into the high yield markets. High yields have a long way to go down should we face another financial crisis spilling over from Europe. Financial stocks look terrible. Looking at prices on the major banks, I think Europe is truly just the first hurdle. Even with an EC solution banks still have to battle through the threat of increasing regulations and continued mortgage defaults. At this point absolutely no one knows how events in Europe will play out. What we have seen is well above average volatility over the past two months, and large moves with every rumor. This is a fools market to try and guess the outcome. Being wrong could be devastating to portfolios if long, or missed opportunities if in cash or short. But where would your clients rather be? Knowing they are protected in a selloff, or on the sidelines at the beginning of a rally? My suggestion is to watch two key indicators: SPY has stayed solidly within its trading range despite all the turmoil. Don’t make any bets until SPY solidly breaks either above or below its current range. Follow JNK and its 30 day SMA. If the economy breaks down JNK still would have to drop over 50% for its yield to approach the levels it peaked at during the last financial crisis. If there is a European solution, realize the rally will be limited by numbers 2 and 3 above – corporate earnings and economic indicators here at home. It seems to me, we are a long way off from an “all clear” signal.